With the final battle of Elate Eight week, we will head into the weekend with the full slate of the Faithful Four. After yesterday’s victory by Franz Jägerstätter over Mecthild of Magdeburg 67% to 33%, three of the four tickets have been punched. Franz will join Stephen and Florence Nightingale while we await the outcome of today’s battle between Raymond Nonnatus and Amelia Bloomer. To make it this far, Raymond defeated John of Nepomuk and Moses the Black while Amelia made it past Philipp Melanchthon and Fanny Crosby. Are you ready for the final three days of the 2017 Saintly Smackdown? Here’s how it will go: On Monday Stephen will face Franz. On Tuesday today’s winner will face Florence Nightingale. On Spy Wednesday, we’ll send one of the two remaining saints to (additional) eternal glory by awarding the coveted Golden Halo. There’s a lot more Madness to come but that’s how next week will go. In the meantime, vote! And spend the weekend preparing for next week’s final flourish. 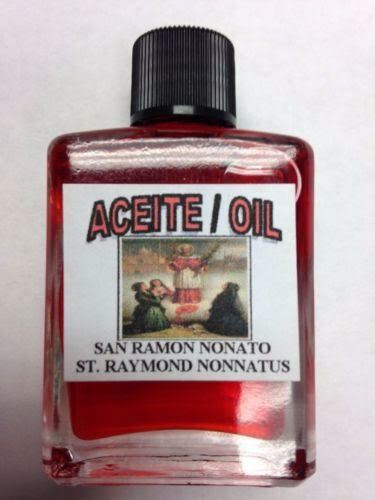 To no one’s surprise, Raymond Nonnatus is a kitsch-heavy saint. There are, of course, the assortment of kitschy items dedicated to Raymond himself. There’s a catchy album of music, if you would care to calmly meditate upon getting your mouth drilled with a red-hot poker. Unfortunately, from the samples provided, it sounds like a head-on collision between Kenny G and that NPR show that comes on at 2:00 am and only plays music about space. On a more serious side, the Library of Seville, in Spain, has a 17th century manuscript detailing the feats and miracles of St. Raymond that is available for free download. 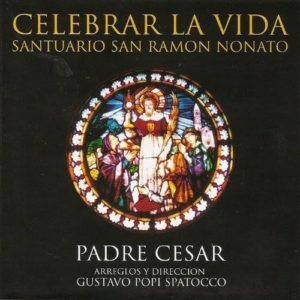 If your Spanish is good, you can grab it for free, and read all about the testimony of the cardinals about the holy saint! We cannot forget that St. Raymond also has his very own TV show. 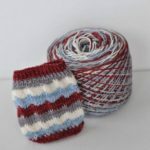 ‘Call the Midwife’ is also a font of lovely tie-in kitsch, from DVDs and cardigans to felt mice and color-coordinated yarn. If you have always wanted to be a do-gooder in the slums of pre-welfare state Britain, you can! Or at least look like it. However, perhaps you have more pressing concerns in the present. Perhaps you are turning to St. Raymond in an effort to stop slander against yourself or a loved one, and what you require is a lock. But not just any lock — no! 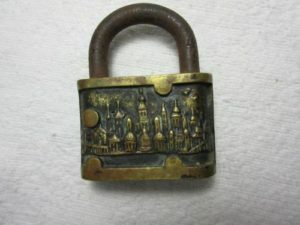 What you need is a special padlock to empower your particular prayer of intercession in this unique case. In such a situation, may I interest you in one of the many antique padlocks the internet helpfully has on offer? Such as this magnificent example, which was made in 1904 with the state seal of Missouri on it to honor the World’s Fair! With this, I imagine you could stop the ENTIRE STATE OF MISSOURI from talking about you. Fear not, brave friend. There is also hope for you. 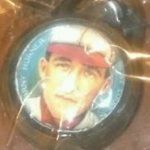 For in the depths of their wisdom, Major League Baseball released a series of commemorative padlocks with the images of pro ball players upon them! Yes! And so you may stop the trash talking of Andy Horner, outfielder for the St. Louis Cardinals with a specific padlock, through the wonders of modern late-stage capitalism. Amelia Bloomer — reformer, suffragette, temperance leader, and Christian. She’s a woman of substance who did not let the limitations placed on her by others define her. 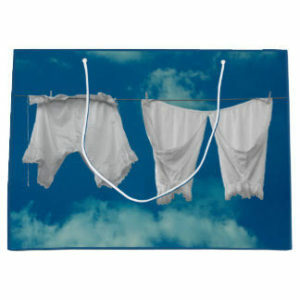 So, as you’re challenging expectations and limitations and marching for justice, don’t forget your Amelia Bloomer tote bag, complete with images of not one but TWO pair of bloomers drying on the line. Comfortable clothing and environmentally friendly, all in one! 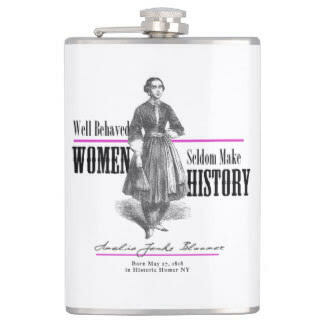 After a long day of marching for the dignity of every human being, relax by having your beverage of choice poured from your very own Amelia Bloomer flask. Of course, because Amelia found alcohol completely immoral, so much so that she wouldn’t dine in a home that had spirits within, you’d only put appropriate beverages in the flask. Amelia’s story is quite amazing, so if you need to brush up on her adventures, you can read all about it at Lent Madness or this nifty children’s book. Let’s not forget that for all Amelia did for women’s rights, she is most commonly remembered not for her intelligent and witty writings in the first newspaper published by and for women, nor for the dedicated work she did to gain women the right to vote and run for public office, nor for the way she challenged the church hierarchy to face their gender bias, but for a pair of pants, bloomers, as they came to be called. We are fortunate that women and men still benefit from her faithful work, and we are fortunate we still benefit from her savvy fashion sense. 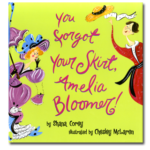 Don’t you want your very own modern interpretation of Amelia Bloomer’s bloomers? 176 Comments to "Raymond Nonnatus vs. Amelia Bloomer"
Going with Amelia, I think she may be my pick to win the whole thing! She IS my pick for the Golden Halo!! Stephen is my pick for the halo. For us to share again. Was given to freeing slaves. And suffered for his faith. Has much to give today. So our lives speak your grace. By God who is all Truth. It’s our great gift to share. Our hope in face of fear. Thanks once again. Facing a day of noise today, so it helps to remember the Patron of Silence! My wife and I would be delighted to visit the Community and meet you! We’re planning a visit sometime in June. I will contact you through the Mother House and let you know when we will be coming. Great, Harlie. I look forward to it. We will be in our annual long retreat from June 12 -18. Other than that, I don’t know what is scheduled, but I should be relatively free to get to know you both. If you want to private message me on Facebook and give me your e-mail, we can be in better contact. My wife sent you a Friend request on Facebook (I think that’s the term. My wife is the Facebook enthusiast in the family!). Your poetry has replaced the hole in my heart left by Oliver’s disappearance! Someone named Oliver voted yesterday. I don’t know if it’s the same Oliver we’ve been concerned about. I miss him, too. Thank you! I have enjoyed your contributions. Well done! Enjoyed it a lot. Sadly, my vote for Nonnatus seems to be a losing one. But I did like the bloomers on display, Laurie. My vote for Neonates, who clearly has the more, and perhaps the better, kitsch of the two, also seems to be going for nonnaught. Thank you Diana! I sang this to my husband as we drove back from the gym. We vote together each day on the way to the gym!! One vote only, of course! Another winner! Please publish, and let us know! The “Hammer Pants” won me over. For the first time this Lent Madness season, I really do not care who wins this match. Voted for Bloomer just because she beat Crosby who was one of my wishes to make the finals. But just like the other Madness by choices are already gone before the final four. I will never vote for a “temperance leader.” Voluntary abstinence is a virtue. Legal prohibitionism is immoral. Seemed like a good idea at the time though. As did women’s franchise and wearing pants. Thank you, Ms. Bloomer, for that! Go Amelia! So, Pete, should we also make opiates (heroin, etc. ), stimluants (speed, crack, etc. ), etc. not subject to prohibition? Is it immoral that they are currently illegal? We look at temperance from the twenty-twenty vision afforded us after discovering the manifold reasons why prohibition does not work. This is patently unfair. Were it not for the efforts of the temperance leaders, there would not have been the push for women to get the vote. One has to ask, absent that push at that time, what would have gained the vote for women?? How long would women have to wait. The temperance folks saw powerless, helpless women watching as their husbands gave in to hopeless despair and drank their wages at the nearest bar. They thought that abolishing drinking would solve the problem, and of course the smug, self righteous ones can say the plan did not work. Actually, by getting women the right to vote, it indirectly DID help those women by enfranchising them, a small step toward their emancipation from the tyranny of their men who were then answerable to no one. They saw an ill and at least tried to do something, and it was only in doing it that we found out decisively why it wasn’t such a great idea after all. Hindsight is always 20/20 and a little smug. 1. A binge-drinking culture that developed because a large number of people were given the false impression that there was very little middle ground between problem drinking and ideologically-driven abstinence even though (as early as the late 19th c.) Americans (at least those living in urban areas) had plenty of examples of responsible imbibers in their Italian-American, Jewish-American, and Greek-American neighbours. 2. An attitude that views any safety-related legislation (seat belts, motorcycle helmets ….) as a “nanny state” intrusion on people’s liberties. 3. An acceptance of organised crime as a “normal” part of society (given that they were the most reliable suppliers of liquor to the public during Prohibition). I voted for Ms. B. because of her involvement in the Women’s Suffrage movement, but I see her involvement in an abstinence-oriented temperance movement as problematic. And, by the way, I’m aware of plenty of examples of domestic violence committed by men who are teetotallers. That is why I could not vote for her. Terrific! My earworm for the day! Thanks so much for taking the time to post that recording! Hey Christians? Where you at? ITS LENNNTTTT MADNESS! GET OUT AND VOTE EARLY! 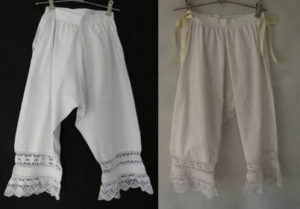 I like bloomers and have some really cute ones from April Cornell for sleeping. So, no choice! I think the kitsch stuff is too much. Really disrespectful to those who went before us. Possibly Amelia would think the bloomers are funny but I don’t like kitsch. Mostly they would not have even understood why some think these things funny now and I have a pretty good sense of humor and I even swear. I really enjoy the kitsch, but do not consider it in my voting; I go back to the earlier posts to refresh my mind on what really matters. I thought this year was very disappointing. I wish that we could stick to actual saints instead of just good dead people. And I have almost without fail picked the loser. Hi Sue. I’m curious about your post, about how you, personally, define actual saints. This is a conversation I’ve had a couple of times in groups, and I’d be interested in having you weigh in. Thanks. Which ones are not a Saint? Sue, I too have been disappointed with the results of the voting. It reminds of junior high school when people voted for something just to see if the absurd would win and they could have a good laugh. Either that or the voting is fixed and I don’t like that scenario either. Maybe I should put the padlock back on my lips this morning, but I hope that I might respectfully say that I really appreciate the addition of just good dead people to the ranks of the saints. It seems to make sainthood more accessible to the rest of us, and adds an interesting element to the whole Lent Madness adventure. I also love the kitsch and the humor, which still appears (to me at least) to respect the faith and courage of the person being considered. There is a vetting process for candidates in LM. They must be recognized somewhere in the church catholic. Some are official Roman Catholic-approved Saints (Stephen, Raymond Nonnatus, Scholastica, Mechtild of Magdeburg, & both Augustines) while others (Amelia Bloomer, Florence Nightingale) are recognized by The Episcopal Church, and then Sarah is in the holy scriptures of both Christianity and Judaism. Some of us are still waiting for Saint Fred of the Neighborhood (who already has at least one Episcopal parish with a commemorative stained glass window in his memory and an icon [https://pbs.twimg.com/media/C8SmyywU0AAKkz1?format=jpg&name=large]) to be eligible for LM. I am also waiting for Saint Fred of the Neighborhood, recommended him last year and will do so again. He was such a tremendous force for good, and it was all based on a strong Christian faith. After his ordination in the Presbyterian church, he was told that his ministry was to be the continuation of his work with children’s broadcasting. This icon is hanging in the office of a priest friend of mine. We may not live long enough to see it, but I’m quite sure Fred Rogers will someday be recognized in some future version of “Holy Women, Holy Men”. O God, whose Spirit guideth us into all truth and maketh us free: Strengthen and sustain us as thou didst thy servants Elizabeth, Amelia, Sojourner, and Harriet. Give us vision and courage to stand against oppression and injustice and all that worketh against the glorious liberty to which thou callest all thy children; through Jesus Christ our Savior, who liveth and reigneth with thee and the Holy Spirit, one God, for ever and ever. Amen. That’s my birthday. Of course, I had to vote for Amelia. While there is a lot to what you say (“Hey, my person got voted off the island, and man, am I stewed!”), but I think we have to consider a few givens here. Like it or not, people are going to see their choices lose. Most votes are in the sixty to forty range, so there are forty per cent of each vote who feel robbed in some way. We all need to practice acceptance. I chose the right person, and so did a lot of others. Unfortunately, more folks who chose the right person chose the person I didn’t pick. But to EACH of us, we all picked the “right” person. The fly in the ointment is that more people picked the other person. We must find ways of accepting that. I didn’t know about several others, and it is due to Lent Madness that my knowledge has been greatly expanded. It is a marvelous thing to learn of the many folks upon whose shoulders we are today standing. Yes, thanks to LM, I appreciate Newton’s comment very much. Newton came up with that phrase? Well, dang! Thanks for the enlightenment, Pamela! Amelia for the win all the way! Had to go with Raymond – laughed out loud! Amelia today. She persevered. Oh, and Claudia: I too adore April Cornell, and may need to get some of those bloomers of which you speak! ..wondering how bloomers would pair with leggings? I love the kitsch posts. Goes along with one of our family rules, “If you can’t laugh, you aren’t doiong it right.” Amelia for the win! Voted for Amelia. Love the kitsch. Go away, #KitschKranks! I chose Nonotus over Amelia because of Call the Midwife, a show that demonstrates some genuine caring and concern for poor people and their health care, in an age where childbirth was still a scary thing. The nurse-midwives of that era were saints in their own right, flawed, perhaps, and very uman, but also loving and nurturing. If any part of that was due to Raymond’s example, I am for him! I must agree with your choice of Nonotus. I too adore Call the Midwife….such a brave and faithful group of women carrying on the work of women’s health issues. I only wish that today’s advocates for fair and equal health might prevail. Finally, kitschy links! All future Kitsch round bloggers should follow Megan’s example. 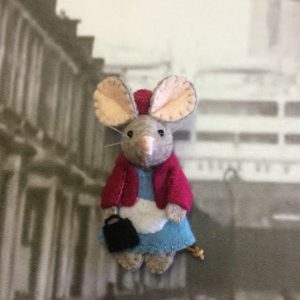 I want that Call the Midwife mouse. Thanks to Megan, I don’t have to painstakingly scour the internet to find it. As for the vote, I still stand by St. Raymond Nonnatus for his slave-freeing efforts at great cost (and of no benefit) to himself. Side Note: I read that book about Ms. Bloomer in my nannying days! I too voted for Nonnatus. His actions were more saintly in my view. Amelia was terrifically important to improving the lives of women and children and I applaud her. In this matchup, however, I go with Nonnatus. Every year on the occasion of my parish’s paternal feast (Trinity Sunday) the Bishop comes to do confirmations et cetera . . . and there is usually a Bishop’s Forum Q & A at 9 o’clock. This year I plan to ask just how one gets someone included in whatever it is Holy Women, Holy Men neé Lessor Feasts & Fasts has been renamed (Cloud of Witnesses?). Amelia reminds us of the power of using our voices in the service of bringing into being a just society. She is an inspiration to journalists in our time. Bloomers freely dancing in the breeze is a nice image. Did not like the bloomers I had to wear in Gym class in Junior High. For that and at least one other very good reason , I will vote for Raymond. Even the mention of St. Louis Cardinals makes me turn the other way. After an interesting incident with a ball stuck on Yadier Molina’s chest protector. A very admirable job by both of our celebrity bloggers today! Such a tough decision, but I am going with Raymond, in part because his faithfulness and bravery were more costly, and because his surname helps me feel good that I took three years of HS Latin. I enjoy the kitsch round, but I respect the right of people to have their own personal sense of humor. It’s a gift from God, to be cherished. To me, the items in the kitsch round are laughable–not the saints they purport to honor. I giggle at the lemonade flask or the icon phone cover because they show how our love for these saints can go a bit overboard at times, or in some cases how silly humans endeavor to extricate a few bucks from the pockets of other silly humans. Not every joke in Lent Madness makes me laugh, not every match- up makes me cry, but taking part always teaches me and connects me to worthwhile people, writing and written about. Now, where can I get me a felt mousie in a nurse outfit to match my “Flo for the Halo” tote bag? Well said & I love the humor & family quote “if you can’t laugh, you’re doing it wrong” So thanks SEC and thanks bloggers for your wit & humor–& thanks for the first thing in the morning laugh out loud,Megan! Wearing my scandalous bloomers from April Cornell (dot com) whilst I vote for the lady. I’m backing Amelia. We’ve already got Florence for the nurses, so let’s go with the woman who helped free the ordinary women from societal oppression! Next year let’s see some fresh candidates to vote for! I don’t mind if they are Saints or saints – just some fresh faces and stories! From the historian: Amelia’s bloomers were actually very full pants with bands at the ankles, which were worn under a just-below-the-knee dress. She would have called them “Turkish Drawers.” She favored them as “reform dress” and an attempt to free women from the restraining fashions of the day. When she (or any of the other early feminists who wore them) walked down the street in Bloomer Costume, dogs were set on her and eggs thrown–women shouldn’t wear the pants! In honor of all the daffodils in bloom in front of my house, I vote for Ms. Bloomer – a woman ahead of her times. I agree with Pete above when he stated that legal prohibition is immoral. The only thing it accomplished was to turn ordinary citizens into criminals while aiding and abetting the real criminals in organized crime to flourish and become wealthy. It’ll be a losing vote, but I’m going with Raymond. And during Prohibition, poisoning people in the name of calling it an “incentive” not to drink was encouraged. Go, Raymond! It seems that I have been bombarded with so many negative words recently that I need a patron saint against gossip, etc. I vote Nonnatus. Alas, I remember having to IRON my gym class bloomers. Haven’t been fond of bloomers or ironing since. Another vote for Raymond! And I voted for Raymond, and the midwives of London and around the world. I went to a public school and had to wear bloomers in Gym class Sounds like the same kind of material you had to wear. Like Amelia for caring about justice in government for women and better, safer fashion, but she seems to have a beam in her heart and eye when it comes to temperance. Raymond’s willingness to sell himself to free others and his focus on serving God makes my vote his. Looking through Amelia’s material here and elsewhere I get it that she was a feminist forerunner., which for sure she’s a winner on, but my idea of saintliness usually has some overt connection to God and Jesus which the writeups so far don’t particularly focus on. So… it’s Nonatus by default. Fighting for justice and equality for half the population seems to me to be very much connected to “God and Jesus.” If you can’t vote and participate fully in the life of your society, you cannot have justice. “Let justice roll down like waters,” says the Good Book. If you’re in that half of the population, you get that. “Nothing says ‘Lent’ like men in harem pants”—!!!! Hilarious!! Wow! 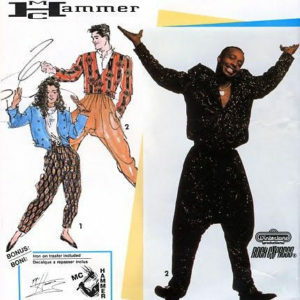 You are awesome and made my day with “Hammer Time”! An early temperance slogan? I always sensed there was a hidden meaning in that lyric! 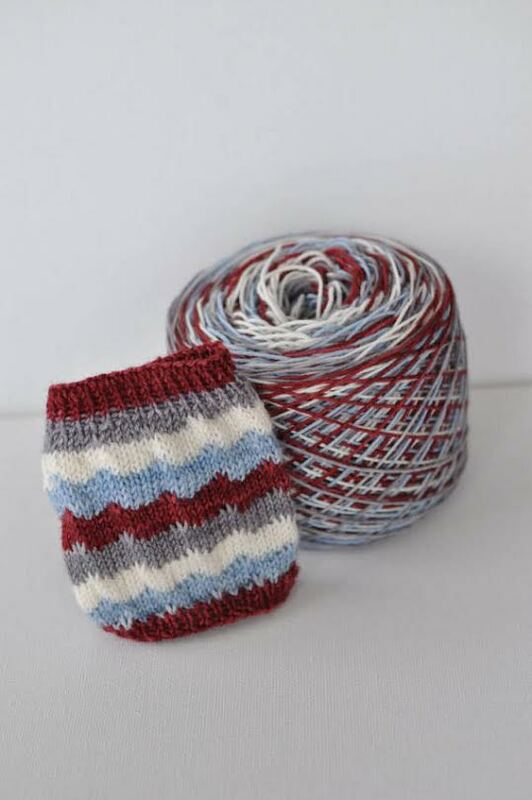 After a bit of thought I decided on Raymond, partly because of Call the Midwife (which I love!) but also the notes about “legal prohibition ” not only being immoral (possibly) but also it does not work! The Hammer pants won us over! I can’t vote for Amelia, as she was an extremist. Refusing to go into houses that even had alcohol in them is a sign of extremism. You are tuned to the Lent Madness channel not the Lent History channel. If you don’t like what’s playing on the Lent Madness channel please feel free to not watch. I’m enjoying the kitsch this week, but I have to tell you (as someone who does historic reenacting of Amelia’s time period) that what you’re calling bloomers are really drawers – meant to be worn under clothing and never seen. They only come to a bit below the knee. Amelia’s bloomers were made of the same material as the rest of her dress – probably wool – and came down to her ankles. I haven’t figured out the knack of posting pictures here, but google her and you’ll see what I mean. That said, I love the rest of what you found! Thank you. I also was concerned that there seemed to be some confusion here between underwear and street clothes–no doubt related to the later usage of “bloomers” to mean a certain type of underpants, as the original “bloomers” did not survive long as ordinary wear. Accurate information–something librarians and library users care about! Raymond Nonnatus, for many reasons, not the least of which is his becoming a slave to save others from slavery. Also, “Call the Midwife’. Did any of you see the first episode of the new season last Sunday? LOL. i know. Such a turn of a phrase! Yes! That one was truly genius. Hey, I _like_ “Music From the Hearts of Space”! It used to come on at a time when people my age were awake. I’ll have to look for it online. Thanks! I need silence. I need to listen more. Plus I do not care for bloomers or prohibition. 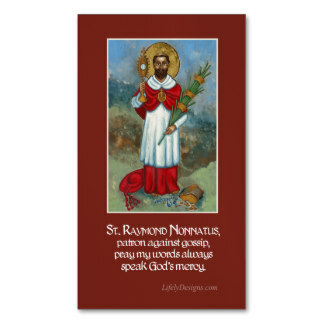 St. Raymond Nonnatus, pray for me! Just to show you how far into the future Amelia took us, the garment on the right (first picture) was known as “split drawers.” My vote goes for the Anglican nuns. Every year for Lent I vow to give up gossiping and complaining about my co-workers. I also think a showdown between St. Raymond Nonnatus and Florence Nightingale would be epic. Voting for St. Raymond. For me, the fruit of Lent Madness is not in who wins, but in the opportunity to learn about 32 disciples of Christ and follow their examples. Whether I was already familiar with them or not, whether they are named saints or not, getting to know these holy people has enriched me and my Lenten journey the past 2 years. And it’s fun to play, so thank you SEC for your work. Peace of Christ. Thanks Sheila. I also enjoy learning about the lives of the, “32” be they saints or commoners. I am always inspired by the breath of God that leads them so passionately to give their all for others. As Jesus did for all. During lent, I read, I smile, I vote and I contemplate how I can aspire. Who could I be with God’s breath? I also look forward to the comments every day. I feel like I have a community of new friends for 6 weeks and then will miss everyone when it is over. Kind of like going home after 6 weeks of summer camp. It appears Amelia Bloomer will win, and I admire her. She had my vote last round. This was a tough choice for me. But have to go all the way with Ray! Got to go with Nonnatus. Great grandmother was a midwife. if only because she made it ok for womrn to wear jeans *in a round about way) I would cast my vote for her…BUT she did so much more! I voted for Amelia, because she had such an ipact on our world today and on the fight for equality for women. But I also have an important question (that may already have been answered): Did we ever find out what happened to Oliver? Wa he unmasked as an adult, or…? Yes, I want to know, too–I miss him! Well, I have a daughter named Amelia, so that should have pretty much dictated my vote. However, I do love Call the Midwife. In the end, I went with Amelia, because (other than that pesky No Alcohol thing) she speaks to the rebel in me. I was going to vote for Amelia anyway. But the fact that there is an Amelia Bloomer (orange juice) flask makes me really happy that I am doing so. I’ve voted for Ms. Bloomer every round for her crusade for women and children in society and in the church. And also, I love the garb! I’ve voted for the other guy in each round with Sr. Nonnatus because of my squeamishness over his birth (surely killed his mom), his slave-trading (even if for their freedom, trading it was), and his mutilation (though not his fault, it gives me nightmares). That term *almost* swayed me toward her candidate, in and of itself. I’m going to use it in social media from this day forward! Sara, I agree that, by buying slaves their freedom, Raymond did, in that sense, participate in the slave trade. But how else could he have done it? Raymond’s caesarian didn’t kill his mom, according to the story. Right after she died, his father asked that this operation be performed to try to save the baby. Raymond risked his life to ransom those held hostage by the medieval version of ISIS, probably realizing that his own life was a gift since his mom died as he was born. Bloomer will get too many votes for representing the women’s suffrage movement, but that movement banned drinking beer, and I can’t live without craft beer. And (to exaggerate) she’s anti-church: how can we celebrate Eucharist without wine? I’m for Ray! Islamic extremism, kidnapping for ransom, issues of war & peace and how to respond to barbarism — these are still with is. Ray chose non-violence, and gave his life (he died a year after being tortured by the Caliph). Go Ray! Well, you know, John, the Baptists and Methodists (I used to be a Methodist!) do it without wine all the time. But it ain’t the same, it ain’t the same at all! Welsh’s Grape Juice was invented by a Methodist and tastes better than sherry* but no where near as good as port. *Yes I know sherry comes out of the linens easier but if clergy & LEMs are careful, there should be no wine on the linens! Well, we see who wears the pants in this competition!! Gee, my wife and I drove through Seneca Falls last summer. The static in the air remains, wow. A lovely flowing river, stately buildings, and …. Amelia Bedelia for me. I know who wears the pants. A victory for Amelia will guarantee that a woman will be in the finals. I voted for Amelia for several reasons, but that was the main one. Thank you, Ellen, for giving the temperance movement some context. It’s always risky to judge people of another time and place without context! Raymond Nonnatus, who dedicated his life to freeing Christians and slaves vs Ms Bloomer, an ardent defender of the marginalized and disenfranchised. Amelia is cool but Nonnatus wins for me. I’m struck by Raymond’s box score: first he freed 140 victims in Valencia hen 280 in Algiers. Then out of cash, he soldiered on and negotiated he release of 28 souls in Tunis with the currency of his own life. Nothing speaks louder about this man’s depth of faith than that. His value wasn’t on huge numbers, even a fractional win, that perverbal raindrop in the ocean was a trade worthy of his life. Reminds me of a certain Son of God we so admire! 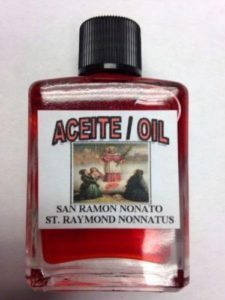 I wonder if Raymond would have had a better shot in Lent Madness if we called him by his non-Anglicized name, Father Ramon Nonato? Ah well! I’m grateful to have ‘met’ this noble Christian soul. I grew up in St. Raymond’s parish in the Bronx which has a lovely stained glass window of its namesake. Gotta go with Raymond. I knit. The yarn tipped the scale. And a Raymond Nonnatus v Florence Nightingale match up would be interesting (except for the nurse midwives of the Lent Madness-verse who would be split between the mother of modern nursing and the patron saint of midwifery). Amelia Bloomer represents all the best in fortitude and get-it-fineness! She is my vote for the Golden Halo! Praise to Diana for putting our saints in prospective in such a way as to aid me in my voting and I marvel at her talent. It is Raymond Nonnatus for me! His Christian self sacrifice, unwavering position against gossip and of course, being the patron saint of midwives, does it for me. Besides, what would communion be without wine being blessed on the altar? Although I voted as I thought I would for Amelia, I did take the offerings from the bloggers quite seriously and listened to a couple of the catchy hits from Celebrar la Vida Santuario San Ramon Nonatus, which is available in its entirety on iTunes for some unknown reason. Megan you nailed it, that album sounds exactly like “a head-on collision between Kenny G and that NPR show that comes on at 2:00 am and only plays music about space.” Yikes! While I still think most highly of Amelia .this vote I must go with Raymond Nonnatus ..AND LIFT MY CUP TO “CALL THE MIDWIFE” and to FRONTIER NURSING UNIVERSITY and the fantastic words on Midwifery they have dispenced.. I write to thank our bloggers for a terrific round of kitsch highlighting the creative imago dei. Indeed, God has a sense of humor and nowhere is this more evident than in saintly kitsch. Now, if we could just find a way to padlock missiles and clothe the world what kind of holy madness that would be. Very well put, Heather. I like your thinking. “Padlock missiles as holy madness.” I too like your thinking. At $3MM per Tomahawk missile, a “symbolic” gesture such as, say, pounding an empty airstrip could cost $180MM, which would fund a lot of Meals on Wheels and Planned Parenthood and PBS and, oh let’s swing for the bleachers here, support for resettlement as our own neighbors of refugees from sarin gas attacks. Has to be Amelia. Can you imagine drinking from a mug with padlocked lips on it? A great match-up. 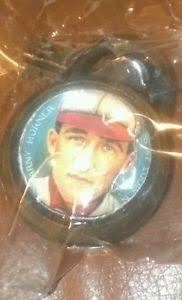 But the best kitsch for this baseball lover is the padlocks with baseball players depicted on them. Raymond of the (baseball) padlocks for me! If my husband were still alive, he’d be searching for those for his baseball memorabilia collection. I’m voting for Raymond Nonnatus, for reasons unrelated to his kitsch, but I loved Megan Castellan’s witty write up. And there’s something just wonderfully nonsensical about an Amelia Bloomer hip flask. Go Amelia but gotta love dead guy perfume. Actually, it’s not perfume. It’s used to cast spells (Santeria, I would guess). I went to the site that sells it, and they also offer Graveyard Dirt. That IS Eau de Dead Guy then! Much as I admire Raymond Nonnatus, I’m pleased Amelia Bloomer is doing as well as she is. I hope in time this sort of feeling gets reflected with visible results in our church hierarchy, but we’ve still got a ways to go in shattering the stained glass ceiling. We (in a large part of the Anglican Communion) have female bishops and we (The Episcopal Church) have had a female Presiding Bishop (and I suspect that I will even live to see a female Archbishop of Canterbury). Voted for each of this noted pair once so far (Nonnatus in the first round, Bloomer in the second). Plenty of good reasons to vote FOR either. No really compelling reason to vote AGAINST either. While I’m not a Kitsch Krank, I tend not to vote according to the kitsch. Nevertheless, both of them have decent kitsch. While there’s a strong a “Call the Midwife” vibe to Raymond, one can say that (as Ms. Nightingale was the founder of the ethos of the nursing profession AND was involved in sharp-end wartime health care), a vote for Nurse Flo in previous (and future) rounds could count as a proxy vote for everyone on “Call the Midwife” AS WELL AS everyone on “M*A*S*H” (even the patron saint of everyone who studied theology in the ’70s and early ’80s, Father Mulcahy). So there’s “Call the Midwife” covered. Still hoping for a Nightingale-Jägerstätter final, but voting for Ms. Bloomer today. I’m glad you brought up “MASH”! Hardest decision yet having voted for both. However in the end the environmentally friendly and comfortable bloomers won me over, alongside the slogan ‘Well behaved women seldom make history’. Oh with what freedom I can sing, and walk all ‘round about! ‘Twill give me health and comfort, and make me useful too.” — The Sibyl magazine, April 15, 1859. SEC – don’t know how to say this otherwise. I haven’t tried, but it looks like I can vote twice – once on my mac and once on my kindle. As I haven’t tried, I don’t know if it would actually go through with the same email. Since we’ve had a try at gaming the madness, I thought I’d let you know that smaller possibility seems to exist. Perhaps it doesn’t and if I’d tried I ‘d know. I have been sorely tempted, but since Flo won easily, I’m figuring on honesty as the best policy.